Did you know from the beginning that you had the beginnings of a multi-platform brand? How did you publish it first? And how have you sustained it for new generations? I was not at Macmillan when The Gruffalo was first published. Kate Wilson, who now runs Nosy Crow, was the MD then. The manuscript for The Gruffalo sat in an editor's inbox at another publisher - and it had sat there for a while. Axel Scheffler was already known to Kate Wilson, and he alerted Kate to the existence of The Gruffalo, which led to its publication at Macmillan. That turned out to be a very good idea. Julia recalls, "Within a week I had a letter," and Macmillan was so keen that it took The Gruffalo to the Bologna Children's Book Fair. "They told me they'd never seen so much interest." It is interesting how the book was perceived to have international potential from the start. How did the idea of The Gruffalo first come about? Julia says, "I intended the book to be about a tiger, but I just couldn't get anything to rhyme with 'tiger'. It just wasn't working. But then I came up with, 'Silly old fox, doesn't he know / there's no such thing as a blank-blank-oh.' Then I began with 'Grrrr', which I hoped would sound quite scary. Then all I needed was a word of three syllables, ending in 'oh'. Somehow, 'gruffalo' came to mind." You can see from the artwork that it took more than one attempt to get the Gruffalo to the perfect creature it is today. The word "gruffalo" made Axel think of a buffalo, so first he drew him with horns and a tail and walking on all fours. Then he decided the creature should stand up, but his editor still thought he looked too scary. There was clearly a challenge at the time between coming up with a creature that was scary enough to be a monster, but not terrifying, getting the balance right. The mouse and the Gruffalo were wearing clothes in one of the first sketches. At one stage the mouse was even wearing lederhosen, but Julia was adamant from the beginning that it was about animals in their natural surroundings. How was The Gruffalo first published? The book was published in March 1999, perfect for the press' Easter round-up reviews. Alyx Price, who was at Macmillan then and who is now back as our communications director, told me that the book received blanket coverage at publication and that many showed a Gruffalo illustration alongside their review. That's when everyone at Macmillan knew they were on to something. I get the impression that everyone knew from the beginning that The Gruffalo had the potential to become a timeless classic - I am not sure anyone saw the potential extent of the brand to grow beyond the books at that time. It certainly didn't have a 360 degree brand approach as many properties have today from the moment they are conceived, but then those were different times. So at what point in this journey of The Gruffalo did you realise that Macmillan had transitioned from picture book publisher to brand publisher? And how has that changed your publishing strategy? 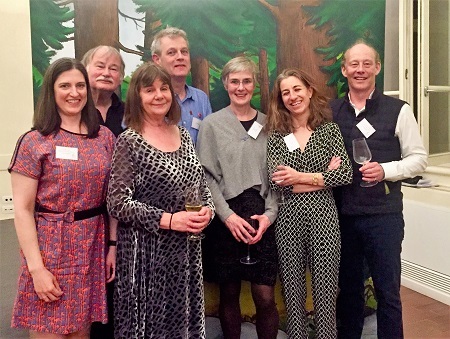 I joined Macmillan seven years ago, and at that time, although The Gruffalo was already huge and we did have some non-picture book formats, it was part of the picture book division and was broadly treated in the same way as other picture books in terms of publishing, processes etc. 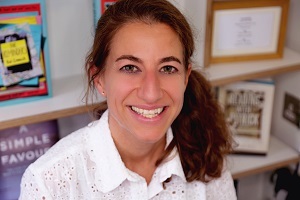 Shortly after joining, I appointed Stephanie Barton to head the picture book division, which included The Gruffalo and other Julia and Axel books. I knew she had extensive brand development experience besides a unique creative vision. Together with the rest of the team we started to separate out the Julia and Axel publishing more to ensure focus on the book-branded possibilities. Five years ago I asked an outside consultant to come in and speak to the team about the licensing market. He kicked off his presentation stating that we were a top five licensing publisher, which changed our way of thinking. In our minds we were always picture book and fiction publishers, but now we had the confidence that our books could compete strongly in the licensing market because of The Gruffalo. It encouraged us to be more experimental in our product development - though at all times with Julia's and Axel's approval, of course. 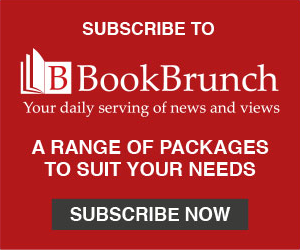 We work very closely with our authors and illustrators, and consider them part of the team that works on a new book being brought to market; they are part of the process, not just the beginning. Previously the creative process around The Gruffalo had worked nearly exclusively from the idea of a format to a new edition (i.e., if touch and feel books were particularly popular in the market, the story of The Gruffalo would be put into a touch and feel format if everyone approved). Now we are less interested in innovative formats and more interested in what The Gruffalo stands for, trying to understand the values the consumer attaches to this character. This is how the idea of the Gruffalo Explorers came about, one of the favourite spin-off publishing series. It's a series of nature spotters' guides. They tap into Axel and Julia's own love of nature and the outdoors, and feel like a very natural (no pun intended!) fit for the picture book, with its deep dark wood setting and woodland characters. Julia also loves The Gruffalo Cook Book, where you can learn how to make Gruffalo crumble. Again, the idea is on brand, a natural extension from the allusions to animal recipes in the story. The other change was that we started focusing more on the consumer, moving from the audience in, ensuring we had books for every age, from babies to experience and grandparents to purchase, for every occasion and touching as many price points as possible. What has been the impact internationally? We have sold 13.5 million copies of The Gruffalo (paperback, hardback and board book) worldwide, and it has been translated into 81 languages, including the north and south dialects of the Sami language and Kolsch, which is spoken around Cologne. The book reprints regularly, so it works on a global scale. The UK paperback alone has had 112 reprints, but the property is of course at different levels in different countries, from successful picture book to brand level. German-speaking markets are key because of Axel, and in those the publishing is as developed as in the UK with films, stage shows, even a Gruffalo opera supporting the brand. In the US, The Gruffalo is also very popular, but The Room on the Broom is even more successful, being the #1 picture book bought at Halloween. I was once told that The Room on the Broom was the Americans' favourite because they have their own monsters in Where the Wild Things Are by Maurice Sendak. I think that is a myth, though it is true that local classics can have an influence on the popularity of the brand. 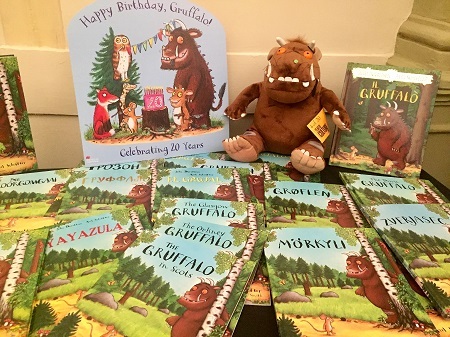 In France, The Gruffalo was recently retranslated and republished by Gallimard, and they are doing a wonderful job of building the brand awareness. In China we have just renewed our licence for the book with the publisher FLTRP. They are doing very well with it, and have plans to build the brand even further through their access to schools and through events. 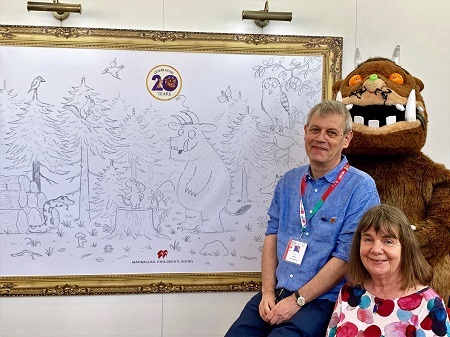 The fact that Julia and her husband Malcolm, a leading paediatrician, have toured the country performing The Gruffalo directly to children at many different venues has definitely had an influence on awareness and sales too. When Julia and Malcolm go on tour, which happens regularly, we immediately see a significant spike in sales in the relevant country. They recently went to India and travelled from Delhi to Kolkata and onwards to Mumbai and Jaipur, performing to thousands of children. Julia is really quite unique in the energy and commitment she puts into promoting her books. She is unstoppable when it comes to reaching out to her audience, and it's in the good old-fashioned way of being there in person. With 81 translations of the book, there is no question though that this is a universally loved monster. Given your experience on The Gruffalo, what do you believe are the key identifiers that make a story or a character stand out and offer the potential for growth to other platforms and markets? Part of The Gruffalo's appeal is that it is a proper fairy tale, and doesn't rely on the reflexive "pro-social" correctness that can afflict children's literature. "It avoids the finger-wagging stuff to which some succumb, myself included," Michael Rosen once said. "There is a wider moral, in that the small person can outwit the big person. But while it has a moral, it isn't moralising." Everyone loves a David and Goliath story, and a not-too-scary monster is always popular in children's literature too. Moreover, reading The Gruffalo is a shared experience: adults like it as much as children. There is something nearly therapeutic about the rhyming and the repetition in the book, when reading it out loud - and Axel's illustrations with attention to detail are of course just perfect and a masterpiece on their own. People so often underestimate what it takes to write a good picture book story and how difficult it is to get a story with a plot and a message to fit 32 pages. I argued recently on a panel that The Gruffalo has depth. It is about so much more than a courageous mouse. It is about finding your self-confidence and resilience to battle on when the world is telling you that you are just a mouse. At the same time, it is a funny, simple story. You can read it in many different ways. Very few author and illustrators have succeeded in pulling off this level of sophistication in a picture book story. Smart people learn from their mistakes, wise people learn from other people's mistakes, so can you share any lessons you have learned? What you would do differently? Given everything has worked so well, I couldn't really think of anything other than that we recently rebranded the paperback look with a specially designed lozenge containing Julia's and Axel's names giving them the lead profile in a theatrical way across all their picture book publishing. It felt like a big decision and a big change. We moved The Gruffalo more to the forefront of the cover and created a more theatre-like approach to the characters. Belinda Ioni Rasmussen is publisher, Macmillan Children's Books.